The crowds at NeoCon registration in the North Lobby or those waiting in the bus line were treated to a series of dynamic demonstrations at NeoCon 2016. INSTALL partnered with Mohawk Group to showcase quality floorcovering products, innovative installation techniques and the value of INSTALL certified installers with the installation of floating carpet tile with FlexLok tabs and loose lay LVT. 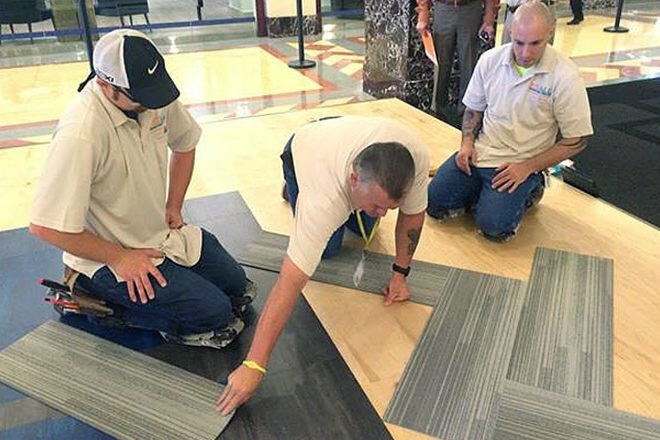 Through these demonstrations we communicated that no matter how great the floorcovering design or product, if it is installed incorrectly, the end result is worthless. INSTALL successfully presented the importance of a properly trained and certified workforce and plans to pursue similar partnerships at various industry events throughout the year.